Your first step in Home buying should be getting home loan pre approval with a mortgage lender. In fact, many real estate professionals require their clients to have home loan pre approval before scheduling home showings. It’s an important first step to take long before submitting an offer. Pre approval for a home loan means that your ability to purchase a home and make monthly mortgage payments have been verified by a mortgage lender. Your credit score, income, tax history, savings, current debt, and work history are important factors in confirming your pre approval. You can find more information about your home buying potential in this previous blog post. What is the difference between pre approval and pre qualification? Pre qualification is based on the analysis of a loan officer. This usually involves looking into your credit, income, current debt, and down payment savings. Pre approval involves a more in-depth analysis of your home buying potential. The pre approval process gives you the opportunity to have approval by an underwriter. An underwriter will take a more in-depth look at your finances and verify that everything is in place for a successful real estate transaction. This makes “pre approval” more valuable than “pre qualification” when you are ready to make an offer on a home. Why is pre approval the first step in home buying? Sellers are more likely to accept an offer from a potential buyer who is pre approved, than someone who isn’t. In the simplest terms pre approval increases your home buying power. In this article you can find information on how to strengthen your offer without going over budget. Besides showing the seller that you are a serious buyer who is prepared for a successful transaction, there are other advantages to home loan pre approval. Having a mortgage consultant on you team gives you a resource for all of your questions. After being pre approved, the mortgage process becomes the easiest part of home buying, giving you the freedom to focus on finding the right home for you. Is home loan pre approval a guarantee? Having pre approval is not the same as a commitment to lend. Ultimately lending laws and regulations exist to protect the investment of both buyers and sellers. This means that there are other variables in the home buying process that can prevent the loan from closing. Issues with the condition of the home, contract disputes between buyer and seller, financial or credit changes during the loan process, conflicts found in the final phase of underwriting, or other issues could cause the loan to be terminated. Find more information about the mortgage process and how you can avoid road blocks in this past blog article. How do I get a home loan pre approval? 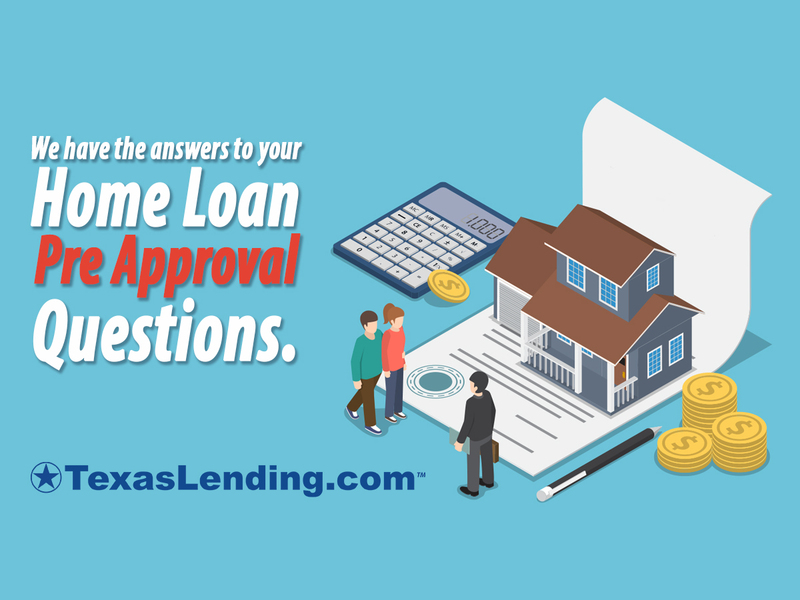 Applying for pre approval is easy and free at texaslending.com . Once you are connected to a mortgage consultant, they will have a conversation with you about your goals and financial outlook. Your mortgage consultant will take your full pre approval application within a few minutes, and keep you up to date on your pre approval status. Most pre approval applications at TexasLending.com are processed within 2-24 hours. When should I apply for pre approval? You should apply for pre approval before you start looking for a home to buy. Even if you are looking to buy a home in a few weeks or months… It’s not too early to get connected with a loan officer and be pre approved. What is the next step after pre approval? Your pre approval will be for an estimated amount within your budget. Once you have your home loan pre approval letter, it’s time to focus on finding the right home for you. Consider working with one of the real estate professionals in our Realtor Connect Program to get cash back after you close on your new home. Find more information on this program in our previous blog article, here. At TexasLending.com we are ready to help you find success in your home ownership goals. Home loan pre approval is the first step in home buying. Whether you are looking to buy home in the next few weeks or months, let us help you increase you buying power with a home loan pre approval.